While the medias and the revolutionaries around the world look at what is happening in France, a lot of information is lost and it is not always easy to follow the facts because of the number of videos and comments which are following each other on social networks. Here is a recap of events for over a month, by a French person who has collected the information of all mainstream medias and radical left medias, to make a synthesis. Originally published by Gothenburg ABC. 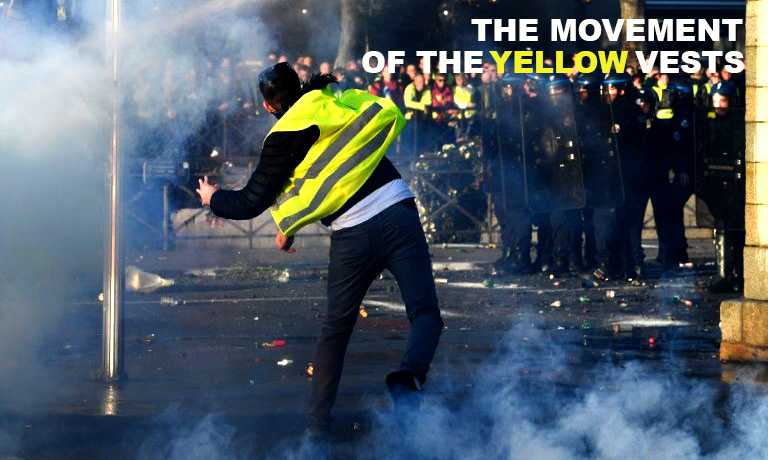 The movement of yellow vests was born on social networks several months ago already. First, there was a petition that received over a million signatures, followed by a call to wear yellow vests (anyone who had a vehicle had to have one of these vests in case of accident) in cars in protest against the increase in fuel prices, which has reached record price in recent months. An event was created on Facebook as a national day of mobilization against rising fuel prices. Like many other motions coming from the popular classes, this idea was very quickly taken up by the extreme right and Marine Le Pen herself called to join this mobilization. That is why, from the beginning, many people refused to join the movement saying that it was a movement led by the extreme right. However, the first day of the event, on 17 November, was extremely well attended, with nearly 300,000 people mobilized throughout France. Yellow vests blocked roundabouts, blocked access to highways and slowed down a lot of road axles. During this day, the medias went to meet the demonstrators to understand who they are and most have claimed to be apolitical, even if some said they were supporters of the National Front (some even helped in this day to stop some migrants). In view of the extent of the mobilization, representatives of several parties joined and called for support. The answer was that yellow vests is a people’s movement that refuses connections with political parties. What most foreign media reported on this day of protest is that the French complain that they can not use their vehicles, and that the movement is part of an approach opposed to the regulations and efforts to be made regarding the climate change. This is why the movement did not seduce outside France at first, except in the extreme right who wanted to believe that 300 000 people had followed the call of Marine Le Pen. The reality is that from this first day of protest, the demands have been extremely varied, depending on the region and the group. But in a general way these claims denounced all the advantages that the Macron government gave to the rich (cancellation of the ISF -> Tax on fortune, laws favoring the exile of capital, a lack of taxes of big French or foreign companies which make billions in France such as Apple, Amazon etc …), while multiplying the taxes for the middle classes and reducing the aid for the most deprived classes, while killing step by step all public services. The French have also shown a huge anger against the condescension of President Macron, who could say such phrases “in the stations, we can see those who win, and those who are nothing”, or his arrogance with unemployed people saying “to find work just cross the street”. After the success of this first day, social networks ignite for a second day and for all those who can, the call is to come to Paris. The police prefecture of Paris has agreed to a demonstration on the Champs de Mars. But the thousands of demonstrators who arrived on the capital decided that they preferred to walk on the Champs Elysees. This avenue, known worldwide has never been used for the marches of anger, located in the beautiful districts of Paris, it symbolizes luxury, and it was therefore a very political choice to walk on this avenue . Also it was bringing the demo get closer to the Palace of l’Elysee where Macron lives and works. The police were not expecting it at all , and quickly groups of demonstrators took the street furniture to mount barricades, in order to slow down their arrival as much as possible. From the first minutes of these barricades, the media spoke of violent groups of extreme right. They spoke of an incident that would make the movement less prominent. Nobody will be able to say if it was only groups of extreme right. At the time in the French radical left, the opinions were very divided between the refusal to walk side by side with fascists, or the refusal to leave them the streets and therefore the need to be present and “clean” the movement of groups such as Generation Identitaires, Bastion social, Action Francaise, or the GUD. Anyway, clearly that day , the movement refused to kindly obey the orders of the police and while the media insisted on the violence of the protesters, the videos posted by the demonstrators themselves on the social networks made a huge buzz and the day after, more than 70% of the French were in favor of the mobilization. Even if most of the medias speak only about big demonstrations in Paris, it must be remembered that since the launch of the movement, groups of yellow vests in the province, are striking or blocking every day, 24/24. Some logistical blocking actions are even to be congratulated as the blocking of warehouses of Amazon the day before and the same day of Black Friday (making impossible all entries or exit of trucks), blockages of total refineries, fires of prefectures of police , free openings on highways, blocks of industrial areas on weekends making major retailers such as Carrefour or Ikea loose millions. Quite quickly, the movement understood that we should not block the population but all the capital. The third Saturday of national mobilization turned very quickly to direct and very violent confrontations with the police. The rich districts of Paris were attacked by dozens of distinct groups, more than a hundred cars were burned, policemen were knocked down and beaten. By certain actions and their way of organizing themselves into small very flexible and fast autonomous groups, it seems obvious that on the third Saturday the radical left is present in the cortege. The media identifies them, but their confusion remains obvious when they talk about the fact that the extreme left and right, combine to break and fight with the police together. What they have not seen is that AFA groups criss-cross the capital in search of extreme right groups and many known fascists such as Yvan Benedetti will lose their teeth. As the insurrection grows, the police violence is increasing. Hundreds of people are injured. The authorities claim to have fired, in Paris only, 10,000 grenades, including 7940 tear gas grenades MP7, 800 disproportionate DMP grenades, 339 grenades “deafening” GLI F4 and 776 40mm Defense Ball Launcher cartridges (which people continue to call “Flashball”). They also say they fired 140,000 liters of water on protesters using their water cannons. Images of ripped-off skulls, broken skulls, exploded hands, various wounds caused by fragments of grenades are found. It should be noted that these grenades GLI F4 are used against populations in France. These are extremely powerful and dangerous weapons. A few months ago the police had made massive use of them on the ZAD Notre Dame des Landes, few people were offended, but in recent weeks, these grenades have wounded amounts of “non-radicalized” people and even several journalists . And so they have finally started talking about it. Beyond the violence of all kinds, the most common chants throughout France is “Macron demission” -> Macron must resign, beside ” Tout le monde deteste la police” (everyone hates the police). A survey says that the French support the movement to 84%! While Paris is recovering with difficulty of week ends conflicts, collateral losses that entail the closure of the Eiffel Tower, all the luxury stores and hundreds of shops in the richer neighborhoods, the government begins to really tremble. For proof, the propaganda of the repression which is made on the television channels where the unions of police come to announce that from now on they will dare to shoot the demonstrators if they are in danger, hiding behind the principle of the legitimate self defense. As the day of 9 December is getting ready, it should be noted that in France, the struggle is joined by the high schools and the universities, most of whom are on strike. The paramedics, the nurses, the firemen, the SNCF ( the railways compagnie) , the post office and many others have days of strikes and join the movement. However for unclear reasons most unions do not call for joining the movement. , and refuse to call the general strike. Are they maybe frustrated that after years of weakening of the mobilizations organized by them, the people could organize themselves, and that it refuses that their representatives, who did not stop eating in the hand of the governments in the last 15 years, can not meet the government as representatives of the movement. Rare and noteworthy, a police union calls for the strike on 9 December. This union is small and affects only the administrative agents, not those who intervene during the demonstrations, but some see it as a huge step towards mutiny and therefore insurrection. While the government had planned tanks and 89,000 police on the territory for the day of 9 December, the violence of the demonstrators was less harsh. In reality, the repression did not give people time to come to the scene of demonstrations, some being stopped from the exit of trains or buses, sometimes by whole group. Ending the day with 1750 arrests in France with 1150 just on Paris, never seen. No figures are yet available on the number of incarcerations since the beginning of the mobilization but it could well reach the hundred. Since the media prefer to speak about the wounds of the cops, here are some examples of the repression of these last weeks. A disabled person thrown out of his wheelchair, made unusable by gendarmes. High school students, kneeling and hands on their heads or tied behind their backs, facing the wall, some in tears, facing CRS who sneer. Terrible picture. The youngest is 12, another is autistic. All will end up in custody and will be interrogated without the help of a lawyer. In total illegality. 50 years after May 68, France is living a new big insurrection. From now on it seems clear that the people demand the resignation of Macron (who remember it , had been elected against Marine Le Pen, with the highest rate of absentee since 1969, elected therefore by nearly 25% of the French only), the French seem to question the representative democracy. They consider that this person does not represent the vast majority of them. On the other hand, even if still too rarely put into words, it seems obvious that the French question capitalism. They ask for better living conditions while some earn in 1 minute what they earn in 10 years of hard work. They want social justice and no longer want the gap between the rich and the poor. They are slowly calling into question the society of over-consumption. While Christmas is the most commercial holiday, many still say to stay on the barricades and that the fight is far from over. Next post: #Stockholm: Support event for antifascists who are imprisoned in Russia!